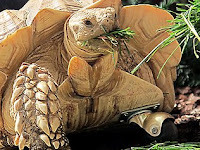 Hare no match for tortoise on wheels! Slow and steady wins the race certainly doesn’t apply to Gamera the 12 year old African tortoise who believe it or not has just acquired a wheel as a leg replacement. Gamera tragically had his leg amputated after suffering a life threatening leg injury only a short time ago. Vets thought it might mean the African tortoise was to continue life as a three legged tortoise becoming even slower and steadier than the usual tortoise. However Gameras luck soon turned after the doctors at Washington State University's veterinary hospital came up with the idea to stick a wheel using epoxy adhesive to his shell under his right shoulder where his leg once stood. The idea was a huge success and Gamera apparently took to his new leg right away. Since then Gamera is said to be healthier and happier than ever and he would no doubt give any Hare a run for their money that was game enough to take him on!